His name may be English but Mr. Blue has the soul of a French artiste and all the mannerisms that go with one. The creative genius of the firm’s canteen, his proudest moments are being awarded three, and later on four, stars from the Firm's Canteen Good Food Guide. This compensates for the daily rejection of his finest dishes by the entire staff of the company. The unrelenting pressure of thinking up new menus to satisfy the jaded palates of his clientele takes its toll on the emotional chef. Frequently he retires to his cubby hole with a bottle of cooking sherry, leaving the kitchen staff to carry on as best they can. He has a reputation as a man fond of his drink - as Peterson of Public Relations is only too happy to relate to anyone he meets - but his worst failing is his vanity. Bristow rumbles him early on. Blue boasts about creating a new dish on his world travels. But Bristow has eaten that dish during his summer holidays and knows it well. "World travels nothing - you went to the Hotel Westerberry, Stoneybeach" he accuses and all Gordon Blue can do is cower with a muttered "Sacre bleu". Blue spends as much time (if not far more) on dreaming up fancy new names for the bog-standard dishes he serves up than in planning the recipes themselves. His invariable fallback is to name everything after Sir Reginald and his family, "Best end of Master Robin" etc. But renaming Poulet en cocotte bonne femme as Poulet Sir Reginald doesn't actually fool anyone, least of all Sir Reginald who never eats in the building anyway. - is the testing of the probationer tea lady Miss Philpots. Mr. Blue, like any creative genius, seeks constant reassurance from his clients. He trawls the canteen for compliments when any new dish is on the menu and will happily accept any kind word (almost any word at all actually). Scene: The Firm's Canteen. Lunchtime. Mr. Blue approaches a customer. Blue:Bonjour Monsieur, would you like today's specialty Poulet en Cocotte Bonne Femme? Clerk:No thanks, I'm skint this week. I'll have beans on toast. Blue:(recovering fast) Ah merci Monsieur you are too kind etc.etc. His worst time is always at Christmas when as one the massed clerks reject his best offerings at the Annual Dinner & Dance. The following strip marked the debut of Mr. Blue. More galling for him must have been the unheard-of attendance of Sir Reginald (not to be repeated). 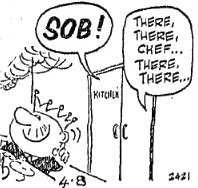 A loud "Sob" may be expected from behind the kitchen door but he gets no sympathy from his customers. Perhaps if the menu just for once offered something other than turkey, sprouts, roast potatos, mince pies and Christmas pudding?